Eric van Zonneveld (1963 - drums and percussion). At eight years old Eric began playing percussion, but has also played bass and guitar. He was really serious about drumming and learned more about it by Tim Krempel (Mark Eeftens drumming school) and later by René Winter (Caesar-Zuiderwijk drumming school). 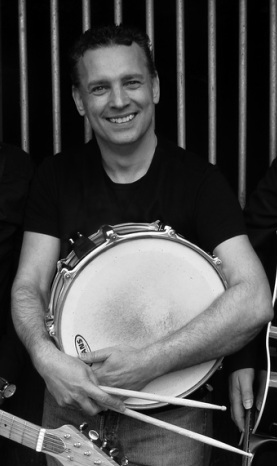 The master percussionists Chanelsy Moniharapon and Martin Verdonk have helped Eric in his further development in percussion. He has played with singer and songwriter Bob Fitts, percussionist Chanelsy Moniharpon, guitarist Rudy de Queljoe, and Salome (The Voice of Holland 2012). He has performed in Indonesia, Suriname, San Fansisco and various places in Europe. He played drums and percussion on the live cd/dvd from Claire “Not alone” (2009). Eric does not come originally out of the country, rockabilly, or Americana style and never thought he would be a drummer in this sort of a band. When he was asked by Matthijs to play percussion for his Johnny Cash performances, he had to think about it and he only did it to help Matthijs. Once he grasped the flow and energy in these musical roots he decided: I want to go further. Eric has lots of pop, funk, and Latin rock in his blood. You can hear these influences in his style and it gives Cashflow their own unique sound.